Working in a fitness centre, I am constantly exposed to people from all sorts of shapes, sizes and... smells. Thankfully, the use of deodorants is something most Kuching folks have caught on to. In fact, there are even some old-school ones that still uses talcum powder too, which works just as fine, despite the powdery effect it leaves on your armpits. 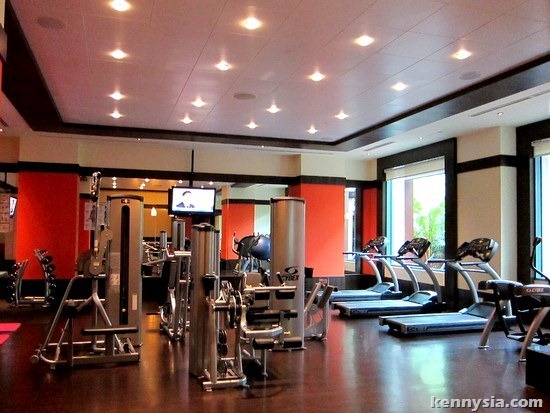 People go to the fitness centre to improve their image. The last thing they wanna happen is stand out for the wrong reasons. After all, nobody cares if you can bench press twice your body weight if you smell like a combination of baby's puke and an unflushed toilet bowl. 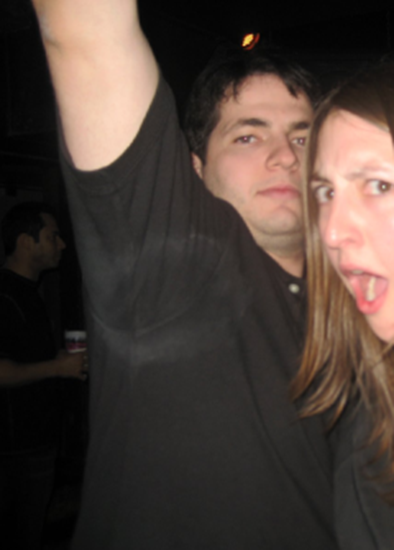 The problem with deodorants, is that after repeated use, they can produce really ugly stain marks on your clothes. This is even more obvious if the clothes are black or white. The white stains can appear on black tops almost immediately. On white tops, yellow stains can appear over time, after repeated washing, ruining your clothes forever! This is not what deodorants are supposed to do! They are supposed to make you smell good, not leave ugly stains on your expensive clothes. You can't solve a problem by creating another problem! Only one deodorant that tackles this issue effectively. 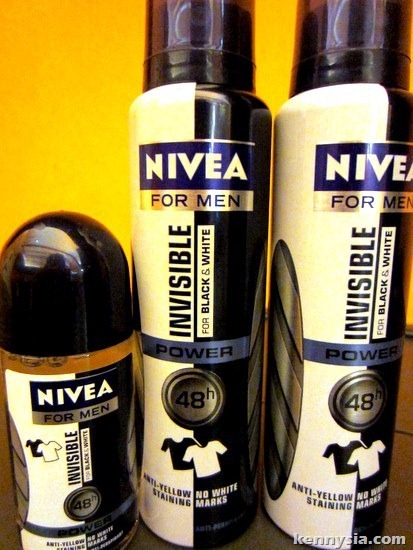 NIVEA recently released the new NIVEA For Men Invisible For Black & White Deodorant, and it works like a charm when it comes to preventing white stains on black clothes and reducing yellow stains on white clothes. kennysia.com: Sweaty And Everyone Knows It from Kenny Sia on Vimeo. No deodorant stains = Wiggle wiggle wiggle, yeah! only got men? any for women? this blog is getting even more interesting.. The observation from "k" is valid. 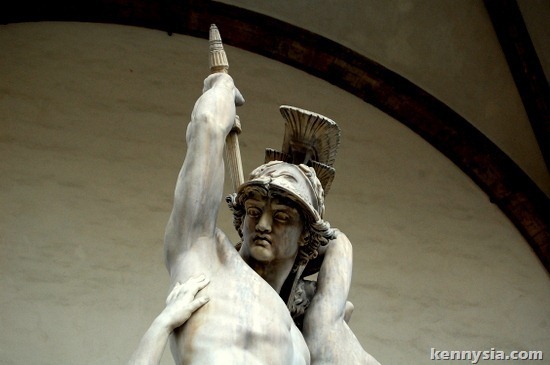 This blog was once molten hot, but it has cool down a lot. Judging from numbers, its PageRank has dropped from 6, to 5 and now to 4. It's Alexa ranking was as high as 80,000 and perhaps even higher, now it's dropped to around 250,000. The number of blog comments used to be in the hundreds, now there are just a dozen or less. Even the length of each comment post is so brief. What has gone wrong? Perhaps the readers have gone tired of reading about the authors various privileged exploits that they can no longer relate to him. His readers would never get to go on as many vacation, meet as many famous people, as he does. Is that envy? Perhaps, but more importantly, the author has moved away from writing about things which he did, when he first got start, topics such as his family, his late father, his struggles, things that make people say, "he's one of us", and cause they to root for him. Make them say, this dude got heart. At the height of this blog's popularity, it does not even have Adsense, now it does. And Nuffnang too. Now he is a celebrity blogger that appears to be commercializing on his blog success. Yes, he needs the money (who doesn't). I suppose that's the purpose of success: to make money. But the point is, blog successes are ephemeral. We have to know what the readers want - some times, it's simply to be a little more like them. Their attention span is short - you bore them and you lose them forever.